Q: How do I stop the high pitched squeaks that often come out of my saxophone section? PJ: Most of the time, extremely high pitched squeaks are due to the student not putting enough of the lower lip over the bottom teeth. The result is not enough cushion which would also give the student an edgy tone. Make sure the weight of the student’s head rests on top of the mouthpiece. If the student clamps down and rests the weight on the bottom lip, this will produce a pinched, edgy tone. Q: Should the student saxophonist drop their jaw when playing in the lower register? PJ: No. The only time a saxophonist should drop their jaw would be to get a jazz subtone sound. This should only be attempted after the student has mastered the basic embouchure and can achieve a proper sound in the low register without dropping their jaw. Q: Several of my saxophone players produce an audible tonguing sound. How can I explain the art of tonguing to saxophonists? PJ: Often times, saxophone students get in the habit of using a harsh, slap tongue. One way of correcting this is to have them think of tonguing on the front tip of the tongue to the back tip of the reed. They should think of the tongue flicking the reed, much like a paintbrush. The tongue does not move around the mouth; the action is very slight. Q: Some of my saxophone students have private teachers, but many don’t. What are some things to watch out for when a private teacher is not there to guide them? Don’t give them a wide open jazz mouthpiece when they play in jazz band. Keep the same mouthpiece for jazz band as they have for concert band. Why? Unless the student has a good, basic concept of a correct embouchure, adding a more open jazz/pop mouthpiece can really hurt their progress. It is often difficult to control the intonation of a jazz mouthpiece. In addition, the student often learns bad habits in order to make the mouthpiece work. Almost all of the jazz techniques can be produced without the aid of a jazz mouthpiece. If the student is not playing loud enough, it could be due to lack of air or too hard of a reed. If the student insists on getting a jazz mouthpiece, choose one that is designed for a more controlled sound, such as the Rousseau Studio Jazz models. Why? Altissimo, or the alternate upper range of the saxophone, is not confined to college but most students are not ready for this technique until they have mastered basic tone and a working vibrato. If this technique is attempted without a strong foundation, it can create serious technical problems in their sound. What is this? Altissimo is the range above palm F or F# on some saxophones. It is created by a change in the air/oral cavity. With proper technique, the student should not have to change the pressure of the embouchure until the get past high B or C.
Q: Should my student play soprano saxophone? PJ: Most saxophone students who advance in playing the saxophone want to play soprano. In general, most high school students should not be encouraged to play this instrument. If the student has a private teacher and is extremely advanced, this would be a possibility. Q: What are some good saxophone mouthpieces? PJ: If a student is not studying privately, it makes sense to choose a mouthpiece that offers a bit more control. Overall, a Selmer C*/S90 or Vandoren (medium facing) are high-end professional mouthpieces that work well for many performers. I’ve found that the Rousseau NC4 provides an excellent response along with the control that many students need. I advise band directors that a complete section of Rousseau NC mouthpieces in concert band will provide a superior section tone. Q: My students believe that using a harder reed shows how advanced they are. How can I explain differently? PJ: That’s a common myth-harder the reed, the better/more advanced you are. 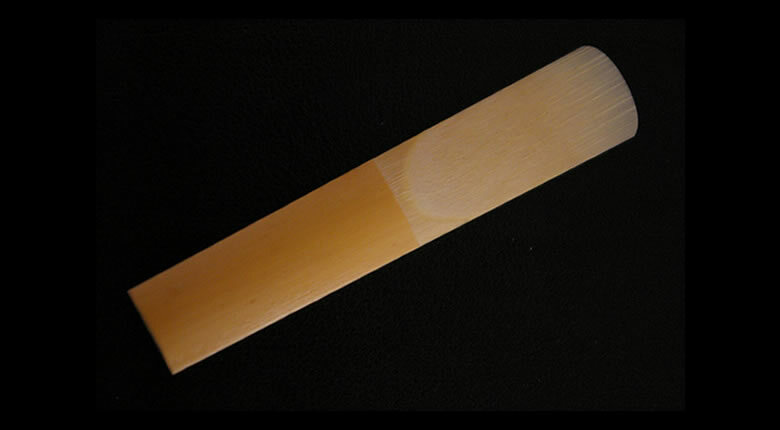 Although it is common to start young students on light reeds, the face of the mouthpiece determines how hard of a reed that you would use. The brand of reed can also determine how hard or soft of a reed to use. These two facts should clear up any personal one-upmanship when it comes to reed strength. Q: Is the clarinet tonguing technique the same as that of the saxophone? PJ: It’s not totally the same, although the correction for a “slap” tongue can be address for both instruments. One difference in tonguing the clarinet is to make sure that the tongue remains in place high in the mouth. The sound will be lost if the clarinetist tongues like a saxophone, lower in the mouth. Q: What are some good clarinet mouthpieces? PJ: I’ve found that the Vandoren M13, the Pyne (crystal one is good for beginning clarinetists), and the Clark W Fobes (Cicero) work well. Q: It’s OK if the clarinetist rests the bell on the leg? PJ: In general, this is not something that should be practiced. If the student is having trouble holding up the instrument, they can purchase a thumb rest or, in some cases, a neck strap that connects to the thumb rest. Q: Bass clarinet is just like playing the saxophone, right? PJ: Not exactly. Although a flat chin is not as necessary for bass clarinet, the air is still similar to a soprano clarinet-cold. Also, the mouthpiece should be at an angle, again much like the soprano clarinet. If the bass clarinet’s neck is not angled to do this, it is fine to push the bell back until this is achieved. PJ: One of the main problems students face with playing a single reed instrument is tonguing. Most of the time, students tongue too harshly. This will usually create a popping sound, which is amplified, as the instrument gets bigger. You cannot spend too much time on improving the art of tonguing. Q: Is it OK if the student’s jaw moves? PJ: No. The only time the jaw moves would be for saxophone vibrato. After a student masters the basic tone on a single reed instrument, they can move the jaw slightly for jazz effects such as a scoop, subtone, or various other techniques. A simple test can make sure that your student has a good grip and proper embouchure on a single reed instrument. Even if everything looks right, your student might not be placing the weight of the head on the top of the mouthpiece. Some students can actually advance quite far by doing this. One easy way to check is to see if you can move the mouthpiece from side to side in their mouth while they are playing. Be careful not to shake them too aggressively, however. The instrument should not move. In some cases, the clarinet should push up into the top teeth. The weight of the saxophonist’s head should rest on the mouthpiece. If the embouchure is correct, their head would shake along with the instrument when you tried to move it back and forth. Q: What about hand position? PJ: Be sure that your saxophonists and clarinetists keep their fingers close to the instrument. On saxophone, in the palm keys, the hand should be in position so they can easily go back to the lower register. In other words, the palm keys are played in the palm. In fact, the F key should be placed on the middle finger by the last knuckle. On clarinet, the throat tone position should be played more towards the first knuckle of the index finger. Basically, the hand should rest around the front keys at all times. American saxophonist Patrick Jones has performed as a soloist, recitalist and chamber musician around the world. As a featured soloist he has performed with the Grammy award-winning ensemble Imani Winds, Zagreb Saxophone Quartet, Erie Philharmonic, and Erie Chamber Orchestra. Additionally, he has been broadcast on the nationally syndicated NPR Program “Saint Paul Sunday” and “Performance Today” playing with the Saint Paul Chamber Orchestra under the baton of Andreas Delfs. He is an active performer, educator, clinician, and Yamaha Performing Artist. He also plays and endorses E. Rousseau mouthpieces.